Featured in the 20th December Christmas Sale are a number of highly sought-after Arts and Crafts pieces from the collection of the late Arthur Mitchell, noted collector of Cotswold School furniture. Born in 1872 in Smethwick, Arthur Mitchell was part of the Mitchell brewing dynasty (later Mitchells and Butlers) who built their Cape Hill brewery in Mitchell’s birth town between 1877-1879. He attended Oundle School where he showed an interest in an art (he was discouraged from following an artistic career) which followed him through his later life. 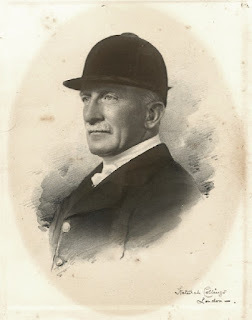 A hunting enthusiast and joint Master of the Cotswold Hunt 1928-1932, Arthur Mitchell moved Cheltenham and lived Glenfall House, which he furnished with Cotswold School pieces, including decorative plaster friezes by Norman Jensen and an extensive collection of furniture from a number of makers. He was a particular friend of Edward Barnsley, receiving a longcase clock of his manufacturer from Sir William Water Butler after 40 years working at Mitchells & Butlers (see above).